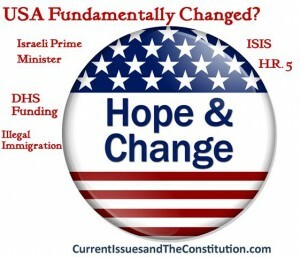 Hope and Change? What Do You Think? Personally I think there is always plenty of hope and change – but not necessarily GOOD change since the election of the President. However in six years you can be sure that 2000 years of history can’t be changed – and not with conservative watch dogs, thank-fully! Do you know your civics? We discuss several states considering giving students a U.S. Citizenship and Immigration Services exam as a prerequisite for graduation. Most candidates who take the naturalization exam are presented ten questions which they answer orally and pass it, on average at 91 percent on their first try. How did the American students fair in comparison? Here is a quick snapshot of the outcome of a random test given to students in the following states: Oklahoma: 2.8 percent passed; and Arizona: 3.5 percent passed. Reportedly only 23 percent knew that George Washington was the first president! Are you surprised? Jeb Bush, 2013, “accelerated path to citizenship.” In the primaries, can he overcome this and his support for Common Core? Israeli Prime Minister Benjamin Netanyahu headed to Washington on Sunday (3/1) to press his case against an emerging deal on Iran’s nuclear program in a contentious address to the U.S. Congress, which he said he is delivering out of concern for Israel’s security.